Property auctions in Durban is increasing with more and more properties being submitted to auction compared to conventional sales through estate agents. There are many misconceptions about auctions and why properties are sold by auction, but the reality is that auctions work for people. We also need to understand the rules and terms of an auction if we want to participate. Here are a few things you need to know before participating in a property auction. Attend as an observer before you plan on buying. Doing your homework before attending an auction as a buyer is important. If you have never been to an auction before, make a plan to attend one or two as an observer before you plan on buying. Once you are ready to bid, get the auction catalogue and/or go to a preview or viewing of the property before the auction. Make sure you are familiar with the rules of the auction and the nature of the property that is on offer. If you have any doubts or questions about the auction process and the implications of bidding, contact the auction house before. Register yourself as a bidder. When registering as a bidder you are required to pay a registration fee in order to participate in the auction. If you haven’t registered, you can’t bid. You will need to provide proof of identity and other necessary documents and will then be given a bidder’s card that will identify you to the auctioneer if you participate in the bidding process. Don’t wait until the last minute. 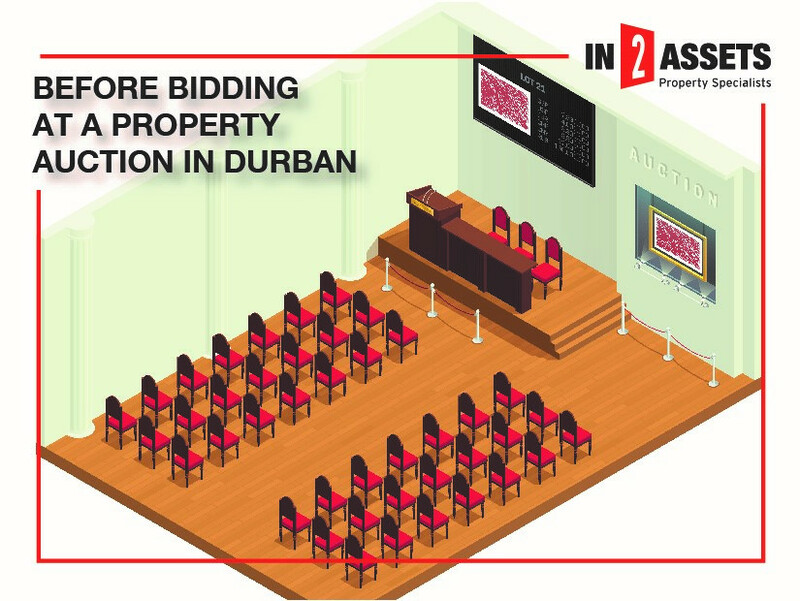 Property auctions in Durban can get competitive, so don’t hold out until the last minute to join the bidding. Opening bids shouldn’t be the lowest possible because this shows competitors that you can be outbid by a small amount. Instead, it is recommended to bid higher so that competitors fall out early. Auctions are not suspensive of conditions of obtaining a loan within a certain period of time. On the fall of the hammer, you immediately have to pay a deposit, normally 10% of the Bid Price and the balance within a certain period of time. Make sure your bank has approved the amount you are prepared to pay. Assess the other bidders at the auction and know your limits. Try to gauge the competition for the lot you are after: Are they dealers or private bidders, or is it a developer showing interest in the property you want? It is important to have your limit in mind, but you may also need to be a bit flexible to ensure that you don’t lose the property by a small margin. All in all, property auctions in Durban, especially when it comes to commercial property, is exciting and something that we at In2Assets are experts at. For the latest in properties available on auction and all the tips and trends, visit www.in2assets.com or contact us on 0861 444 769. © 2019 In2assets Property Specialists. All Rights Reserved.